Once overshadowed by fellow moon Titan, Enceladus is finally getting the recognition many in the scientific community have sought out. Read on to learn why it has earned the interest and awe of so many. Enceladus not only has the highest albedo, or measure of reflectiveness, of the solar system but it also has a rather interesting property that is truly unique: it emits huge plumes. And as it turns out those plumes may be exciting for the possibility of life on Enceladus. In June of 2009 German and UK scientists found that table salt could be up to 2 percent of the material that are in the plumes, nearly the same concentration as that found on Earth. This is encouraging because salt in water usually means that erosion is occurring and hence a good source of minerals. And in July 2009 the mass spectrometer on Cassini found ammonia in the debris. This means that liquid water could exist despite the -136 degrees F conditions it would be under. And later observations showed a ph level between 11 and 12, further indicating the salty and acidic nature of Enceladus. Other chemical signatures detected include propane, methane, and formaldehyde, with sodium carbonate levels comparable to those on Earth's Mono Lake. Plus, large organic molecules were spotted with about 3% of them being heavier than 200 atomic mass units, or 10 times heavier than methane. Organics of course are something that can be a sign of life (Grant 12, Johnson "Enceladus", Douthitt 56, Betz "Curtains" 13, Postberg 41, Scharping, Klesman). The plumes that leave the moon near its south pole becomes plasmic in nature, or that it exits as a highly ionized gas, as it interacts with Saturn's magnetic field. Scientists can learn about plasma behavior and Saturn's magnetic field based on how the plasma acts after leaving the moon. Cassini's plasma spectrometer, magnetometer, magnetosphere imaging, and the radio and plasma science instruments were key in the finding that the plasma mix is made of particles from a few molecules to almost a thousandth of an inch. They also found that almost 90% of the electrons in the plasma tended to be near the larger particles, causing the larger particles to be negative and the smaller one positive. This is the opposite of normal plasma behavior (JPL "Enceladus"). So, what type of particles are the electrons clinging to? The plasma mix is mainly water vapor and dust and thus has different characteristics. After looking at the data scientists concluded that the water molecules mainly stuck together while dust between a nanometer and a micrometer held a majority of the electrons. 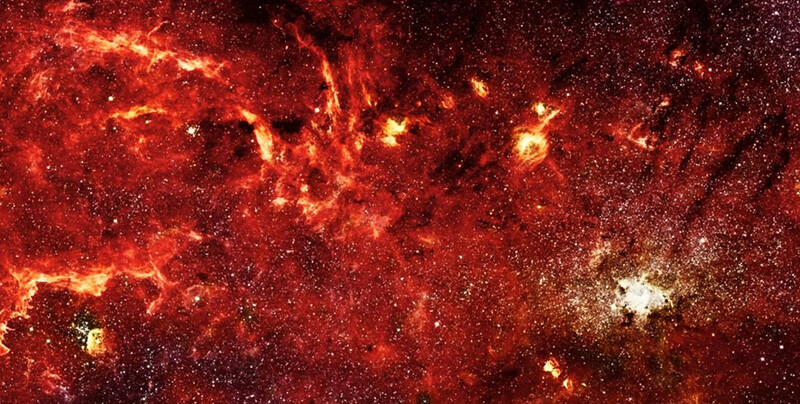 Not in any other place in the solar system has this type of plasma interaction been recorded and it is sure to reveal many surprising properties in the field of plasma mechanics (Ibid). This stream does fluctuate, for Enceldaus orbits Saturn in 33 hours. Because of the elliptical orbit, Enceladus goes through tidal forces, or gravitational pull, that heats up the subsurface water. In fact, as Enceladus gets closer to Saturn the fissures from which the water vapor escapes close up and as Enceladus gets further from Saturn the fissures open up. 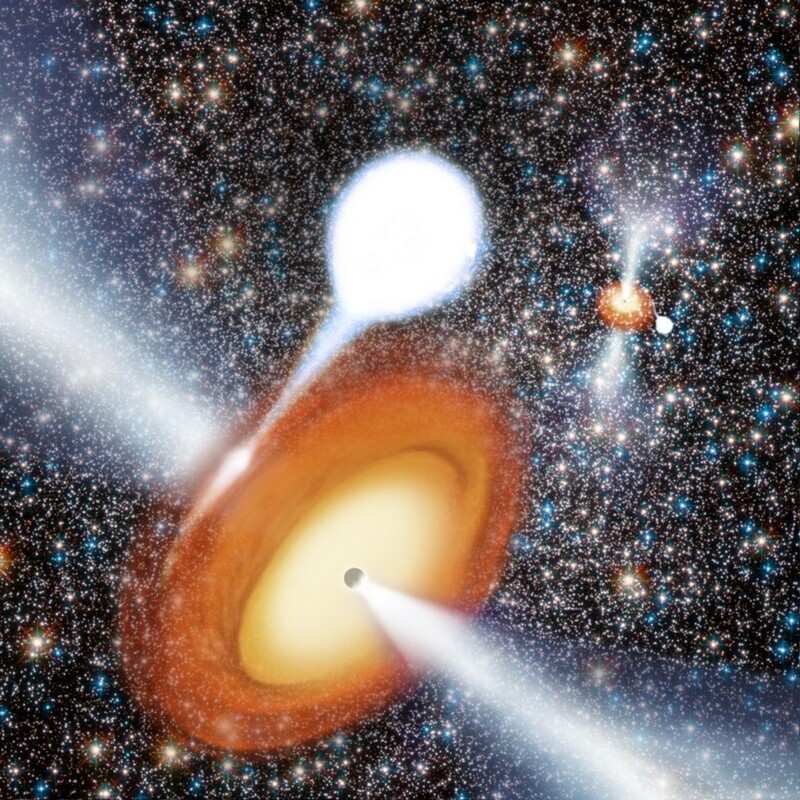 Infrared observations gathered by the Visual and Infrared Mapping Spectrometer from 2005 to 2012 show that the plumes can increase in size by as much as 3 times their minimum and also escape at a faster velocity. Scientists suspect that the pull of gravity closes the fissures but that once the gravity is less the fissures open back up. This may also explain why the peak for emissions is 5 hours after the moon's perihelion with Saturn (Johnson "Enceladus", NASA "Cassini Spacecraft," Haynes "Saturn's"). After nearly a decade of observations, in mid-2014 scientists announced that 101 separate geysers had been located on Enceladus. They are scattered among the cracks at the south pole and correlate to hot spots on the moon, with higher temperatures corresponding to higher emissions. As it turns out, the friction the water vapor produces by leaving the fissure creates the heat that Cassini measured at 2.2 cm wavelength and not by surface heating of photon collisions. Most significant, the size of the openings of the geysers were only 20-40 feet in size, too small to be a result of surface friction. They must have a source deep down to allow such small openings to dispel material, giving further evidence for a subsurface ocean (JPL "Cassini Spacecraft", Wall "101," Postberg 40-1, Timmer "On"). And after many gravity readings Cassini was able to confirm that Enceladus does have a liquid ocean. The moon orbited too much for it to have a solid interior and models based off the Cassini data point to a liquid ocean. How so? 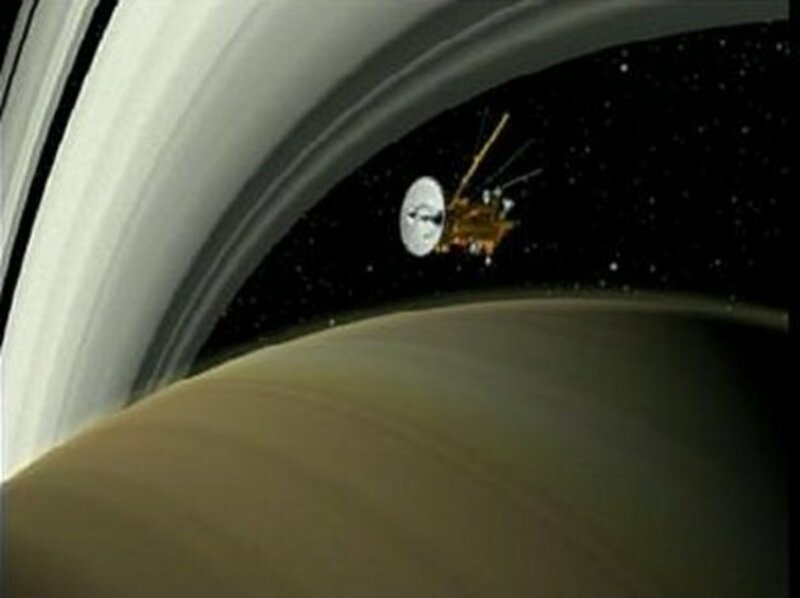 Gravity tugs at objects and as Cassini beams radio waves back to Earth, Doppler shifts record the intensity of the gravity. After over 19 flybys of the moon enough data was collected to see how different places tugged at different rates. Also, images from Cassini show that the surface rotates at a slightly different rate than the rest of the moon. The potential ocean may be 6 miles deep and underneath 19-25 miles of ice. Another chance for life in our solar system! 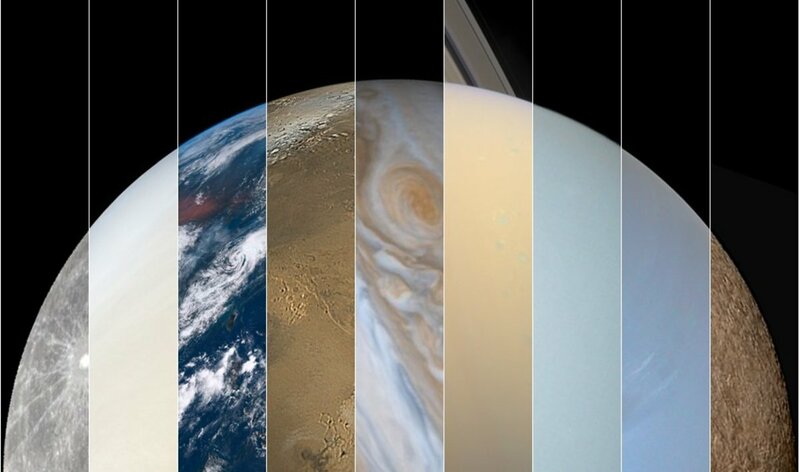 (NASA "Cassini," JPL "NASA," Postberg 41). After examining images Cassini has taken of Enceladus over the years, scientists concluded that a majority of the eruptions we see from the moon are more spread out along the fissures on the surface and not as concentrated jets at specific places. The perspective is key, with different points of Cassini's orbit yielding new views on the fissures, according to a May 7 2015 issue of Nature by Joseph Spitale (from the Planetary Science Institute). Yes, specific jets still occur but a majority of the material that leaves the moon departs in these diffuse curtains after image processing constantly showed a background glow of material along the fractures in the surface. After a stellar occultation, Cassini found that the fissures are sending out 20% more material at the furthest distance from Saturn instead of the predicted 100% that models had indicated (JPL "Saturn moon's," Betz "Curtains" 13, PSI). And do those jets impact Saturn's rings? You betcha. Recent observations and computer analysis from Colin Mitchell of the Space Science Institute in Boulder have shown that each geyser flow and its materials manage to escape the pull of the moon and leave behind a wake that eventually gets stretched out into the E ring. It wasn't easy to spot them, however. Certain lighting conditions were needed to get the material to reflect enough light to be captured on camera. In fact, the size of the particles was found to be 1/100,000 of an inch in diameter which matches the size of the material in the E ring. But it gets even better: By knowing how much mass is leaving the moon, scientists can possibly forecast the future date when all the water will be gone from Enceladus (Cassini Imaging Central Lab "Icy tendrils," Postberg 41). And those particles which enter the E ring have some interesting implications. 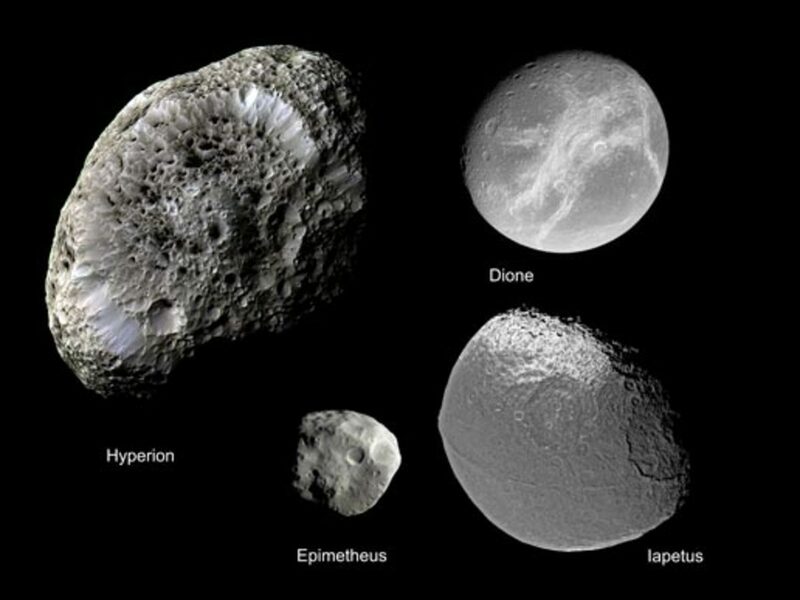 They had traces of oxygen, sodium, and magnesium but the majority of them were made of silica (Si02) which is not a very common molecule to find in the sizes seen by Cassini. The ocean from which those jets have arisen is likely about 1/10 the volume of our Indian Ocean. Based off the mainly alkaline and salty make up of the jets, scientists feel the ocean must be near a rocky core. Another hint of this proximity arises from those silica jet particles that have hit Cassini, which are about 20 nm in size. Based off simulations from Hsiang-Wen Hsu (University of Colorado Boulder), those particles could only have come from the rocky core of Enceladus. Scientists concluded that either something is breaking down the rocky core of Enceladus or that crystallization of silica concentrated solution occurs after existing in a hot, alkaline solution. And we do know something here on Earth that does that: hydrothermal vents! But to make sure Yosuhito Sekine (University of Toky) replicated the expected conditions on Enceladus and tried to generate the particles. They had hot water with ammonia, sodium bicarbonate, olivine, and pyroxene. After mixing well, the sample was frozen in a manner consistent with leaving Enceladus through a geyser. Turns out the condensation removes silica well because the water no longer has sufficient energy to trap it. So long as the water is above 90 degrees Celsius and has an acidity of 8.5 to 10.5 on the ph scale, the particles can be generated. And here on Earth, life exists at vents like these. Enceldaus makes the case for life better and better (Johnson "Hints," Betz "Hydrothermal," Postberg 41, White, Wenz "Prospects"). 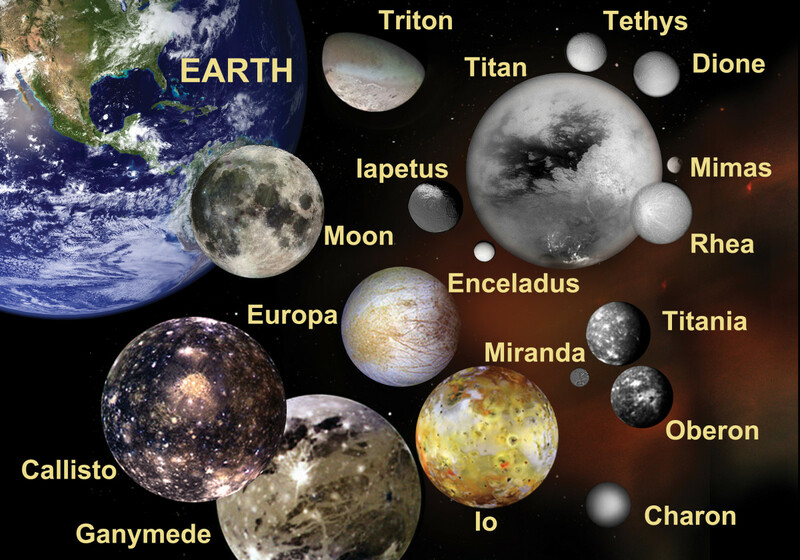 The typical life of silica on Enceladus from ocean to jet is as follows. After forming near the vent, the silica floats around in the ocean 60 km below but heat currents bring them to the ice-ocean boundary. Some will enter the fissures near the south pole, and because the density of the seawater is greater than that of the ice, the ice will float and the water should be stopped at 0.5 kilometers below the surface. But that water contains CO2 and as the pressure decreases near the surface, the gases inside the water are released. This causes the water to be pushed until it is 100 meters below the surface, where ice caves exist and so the water pools there. That CO2 gas keeps building until finally an explosive release occurs. The heat is rapidly distributed on the surface and the crystallization occurs with the silica being released from the water. If enough of a velocity is imparted on the particles they will escape the surface of Enceladus, where it will either journey to the E ring, fall back onto Enceladus as snow, or escape into interstellar space (Postberg 43). As a side note, that snow can be as deep as 100 m. Based on that height estimate and the rate of particle production seen at Enceladus, those jets have been going on for about 10 million years (Postberg 41, EPSC). One of the possibilities for the silica was the break down of a rocky core. But what if the core isn't just solid rock? What if in fact it is porous, like the surface of a sponge? Recent computer models based off Cassini data point to this being the case, with nearly 20-30% empty space in it based off of density readings from flybys. Why would we expect the core to be this way? Because if it is so, then the tidal forces Enceladus experiences from Saturn would flex that enough to generate the heat we see. Otherwise, the heat source remains unknown for an object that should have frozen millions of years ago. And that flexing may release silica into the ocean. The model shows that this system also causes the crust near the poles to be thinnest - as we have seen - and should generate 10-30 Gigawatts of power (Parks, Timmer "Enceladus"). Betz, Eric. "Curtains of Ice Spew From Enceladus' Salty Seas." 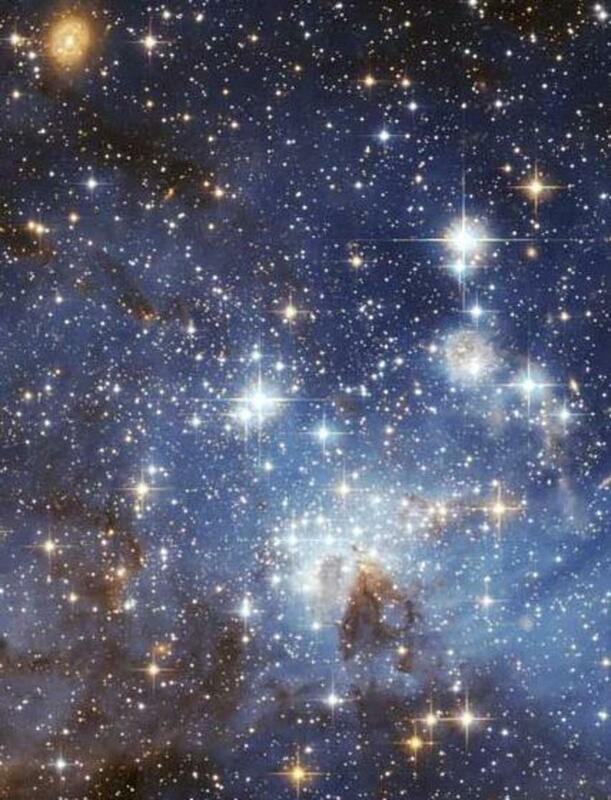 Astronomy Sept. 2015: 13. Print. ---. 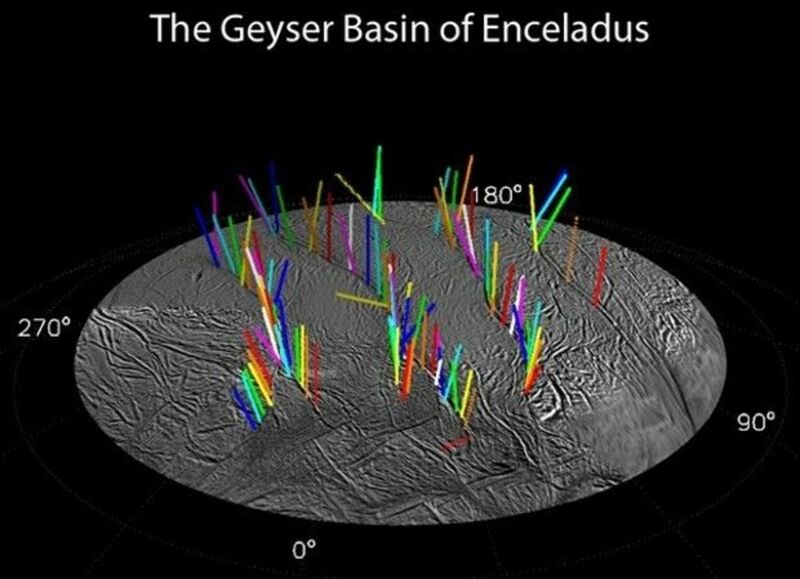 "Hydrothermal Vents Brew in Enceladus' Ocean" Astronomy Jul. 2015: 15. Print. Douthitt, Bill. "Beautiful Stranger." National Geographic Dec. 2006: 51, 56. Print. Grant, Andrew. "Wonder Worlds." Discover Oct. 2009: 12. Print. EPSC. "Enceladus Weather: Snow Flurries and Perfect Powder for Skiing." Astronomy.com. Kalmbach Publishing Co., 05 Oct. 2011. Web. 20 Jun. 2017. Haynes, Korey. "Saturn's Moons are Young and Active." Astronomy Jul. 2016: 9. Print. Klesman, Allison. "Massive organic molecules found in Enceladus' plume." Astronomy. Nov. 2018. Print. Johnson, Scott K. "Enceladus' Icy Jets Pulse to the Rhythm of Its Orbit." ars technica. Conte Nast., 31 Jul. 2013. Web. 27 Dec. 2014. ---. "Hints of hydrothermal activity on floor of Enceladus’ ocean." ars technica. Conte Nast., 11 Mar. 2015. Web. 29 Oct. 2015. JPL. "Cassini Spacecraft Reveals 101 Geysers and More on Icy Saturn Moon." Astronomy.com. Kalmbach Publishing Co., 29 Jul. 2014. Web. 29 Dec. 2014. ---. 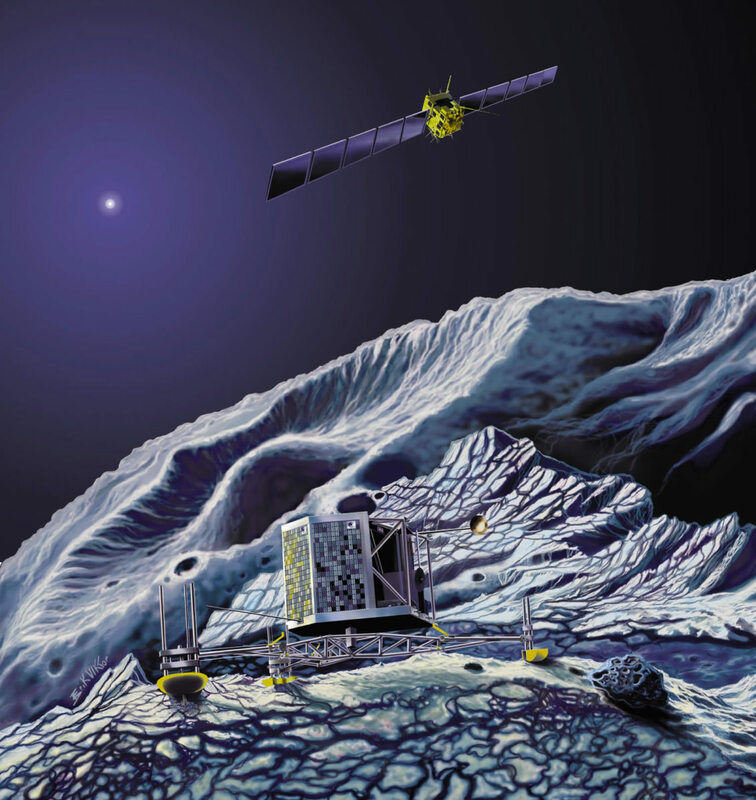 "Enceladus Plume is a New Kind of Plasma Laboratory. Astronomy.com. Kalmbach Publishing Co., 01 Jun. 2014. Web. 27 Dec. 2014. ---. "NASA Space Assets Detect Ocean Inside Saturn Moon." Astronomy.com. Kalmbach Publishing Co., 04 Apr. 2014. Web. 25 Jul. 2016. ---. 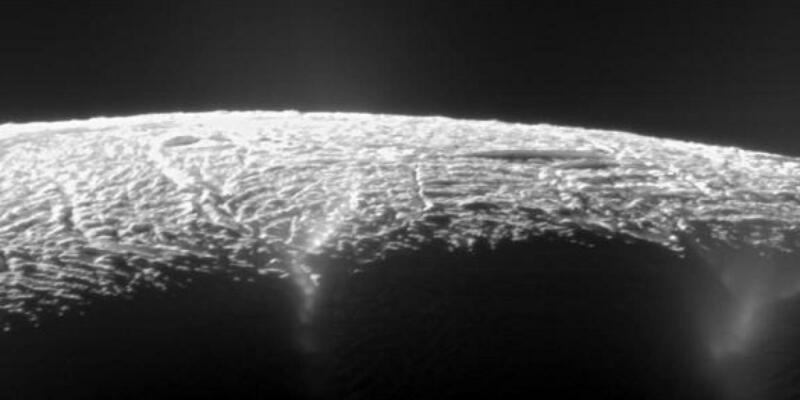 "Saturn moon's activity could be 'curtain eruptions." Astronomy.com. Kalmbach Publishing Co., 07 May 2015. Web. 10 Jun. 2015. NASA. "Cassini finds global ocean in Saturn’s moon Enceladus." Astronomy.com. Kalmbach Publishing Co., 15 Sept. 2015. Web. 22 Oct. 2015. NASA/JPL. 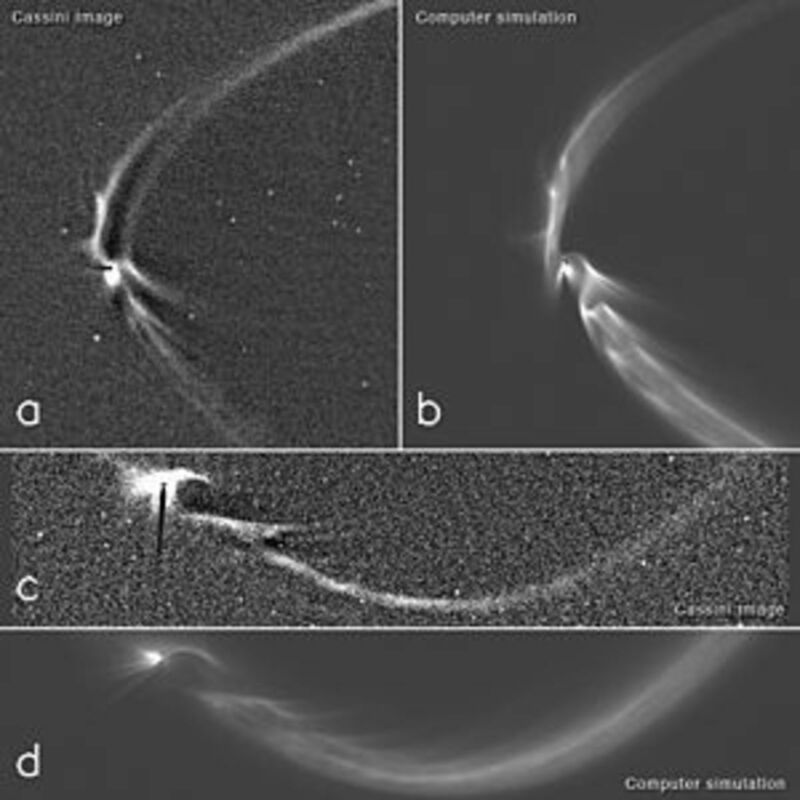 "Cassini Spacecraft Reveals Forces Controlling Saturn Moon Jets." Astronomy.com. Kalmbach Publishing Co., 02 Aug. 2013. Web. 27 Dec. 2014. Parks, Jake. "Why Won't Enceladus Just Freeze Already?" Astronomy.com. Kalmbach Publishing Co., 07 Nov. 2017. Web. 13 Dec. 2017. Postberg, Frank. "Under the Sea of Enceladus." Scientific American Oct. 2016: 40-1, 43. Print. PSI. "Stellar Occultation Offers New Insights on Enceladus' Geysers." Astronomy.com. Kalmbach Publishing Co., 09 May 2016. Web. 20 Oct. 2017. Scharping, Nathaniel. "Cassini Finds Massive Organic Molecules in Enceladus’ Plumes." Astronomy.com. Kalmbach Publishing Co., 27 Jun. 2018. Web. 13 Aug. 2018. Timmer, John. 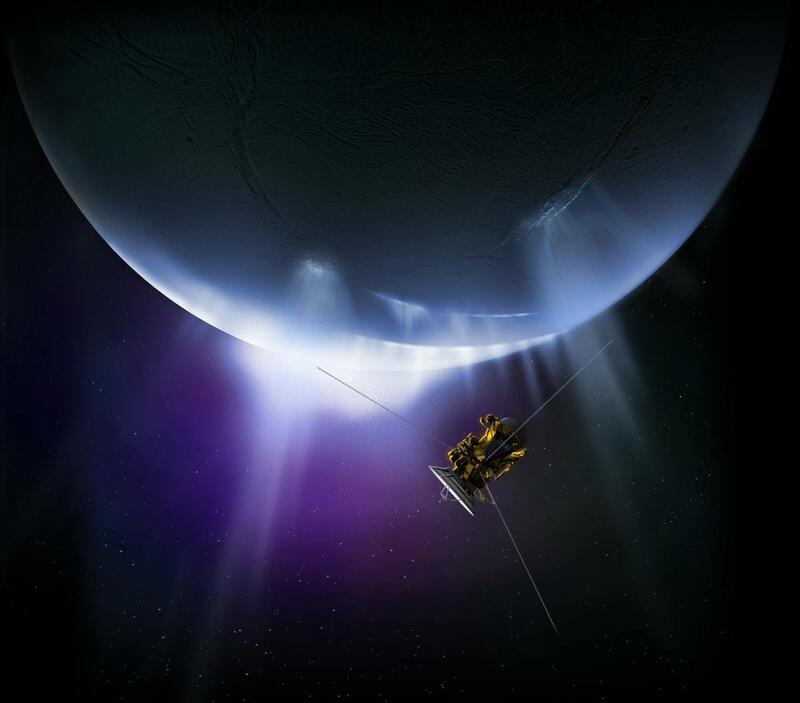 "Enceladus Heats Up Because Its Core Is Like A Sponge." arstechnica.com. Kalmbach Publishing Co., 12 Nov. 2017. Web. 15 Dec. 2017. ---. "On Saturn's Moon Enceladus, Liquid Water May Be Close to the Surface." arstechnica.com. Conte Nast., 14 Mar. 2017. Web. 01 Nov. 2017. Wall, Mike. "101 Geysers Discovered On Saturn's Icy Moon Enceladus." HuffingtonPost.com. Huffington Post, 30 Jul. 2014. Web. 29 Dec. 2014. Wenz, John. "Prospects for Life on Enceladus." Astronomy Aug. 2017. Print. 12. White, Maorina. 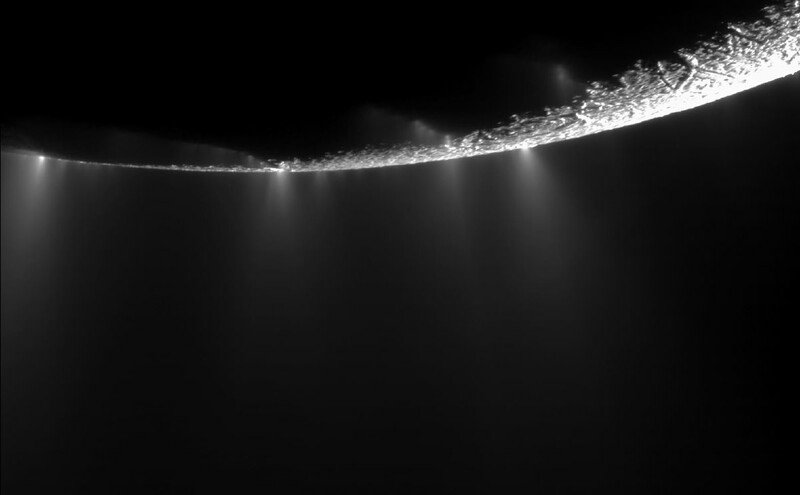 "Saturn's Moon Enceladus May Have Warm Ocean, Boosting Likelihood of Life On Icy Satellite." HuffingtonPost.com. Huffington Post, 12 Mar. 2015. web. 20 Jun. 2017.